The G20 Youth Forum was the largest international event organised for young leaders in 2013, and over 1 500 young leaders, students and academics, representatives from the business world and governments participated in it. 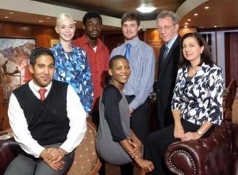 *Six students from the University of Pretoria had been selected as representatives of the South African youth contingent to attend the Forum in Saint Petersburg from 17 to 21 April 2013. The UP team was joined in the youth contingent by representatives from Stellenbosch University and North-West University as well as members of the North-West Provincial Parliament, resulting in South Africa being one of the most represented countries and the University of Pretoria one of the most represented universities at this Forum. The G20 Youth Forum is an international non-governmental, non-profit organisation with the aim of creating a platform for alumni, experts, academics, parliamentarians as well as business representatives to interact and to cooperate on a day-to-day basis over a wide variety of issues. It is intended that this will one day lead to a common global community working together to solve current world problems. The forum consisted of different discussion tables which included world politics and international relations, international law and legislation, world economy and finance, social dimension: youth, education and gender, as well as innovation, technology and science. Two students from the University of Pretoria had the honour of presenting papers to the international audience. As a representative of the Faculty of Law, Martie Bradley delivered a paper at the Law and Legislation roundtable on ’Drone warfare: A necessity for national security, or government sponsored (justified) anonymous execution?’. Vincent Dadam Kosga Djaowe delivered a paper at the World Economy and Finance roundtable on ‘Monetary Policy and Unemployment’. Both these papers were included in the international conference journal, which will be circulated to the relevant international bodies. The participants from the University of Pretoria were Dr Mzukisi Qobo, a PhD (Politics) student of the University of Warwick and a Senior Lecturer in the Department of Political Sciences; Ms Martha Magdalena Bradley, an LLM (International Law) student and an academic associate at the Department of Public Law, Faculty of Law; Mr Vincent Dadam Kosga Djaowe, an MCom (Economics) student and research assistant in the Department of Economics; Ms Sithembile Mbete, a PhD (International Relations) student in the Department of Political Sciences; Mr Erik Meyer, an MCom (Financial Sciences) student; and Mr Ismaeel Samaai, a BPolSci LLM student and an assistant lecturer in the Department of Political Sciences. ** Click here for the G20 Youth Forum Results.